can apply online from 15-09-2018 at 02:00 pm to 27-09-2018 at 05:00 pm. Online applications iwll be accepted through GHC official website of http://ghcrecruitment.in/SAAppln/home.htm. Other details of age, educational qualification, selection process & how to apply are given below. 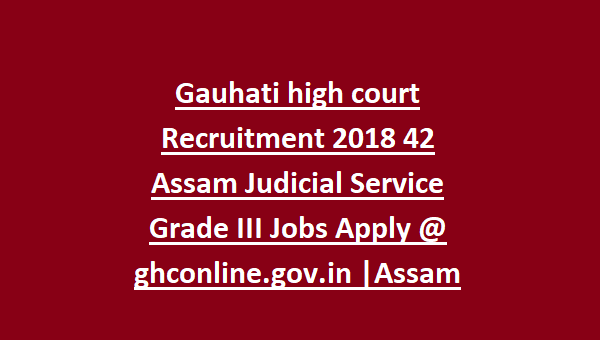 Gauhati High Court Jobs Interested Aspirants should apply by clicking the website address on or before last date fee submission will be 29-09-2018. 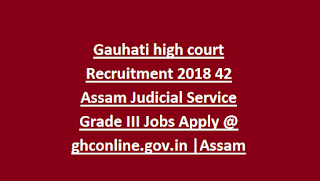 Gauhati Jobs applying candidates should possess degree in Law from recognized University , for more details about Gauhati High Court jobs click on gauhati official website given bellow. SC/ ST, 21 to 48 years PWD candidates as on the last date of receipt of application. Select the post and Click on Apply Online button. Read the Instructions and Click on New Registration. Assam Judicial Service jobs applied candidate who will secure 60% or more marks in the Preliminary Examination shall be eligible for appearing in the Main Examination. The ratio in which the candidates will be called for Viva voce/interview is 1:3 based on the subject to marks obtained as stated above.